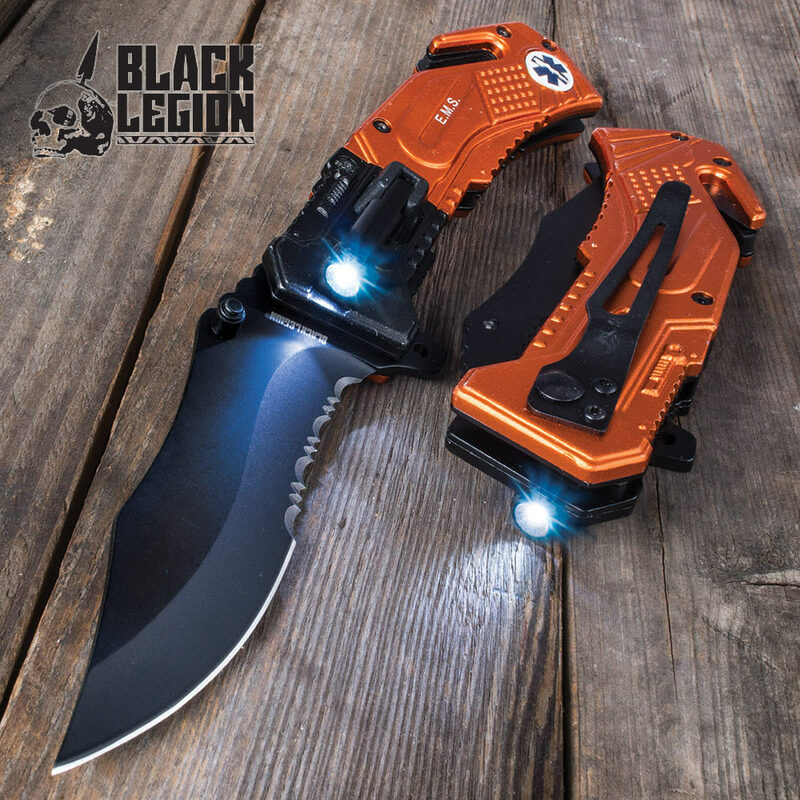 Light the way forward, just like paramedics and EMTs, with Black Legion's versatile EMS Everyday Carry Pocket Knife, which includes a handy built-in LED flashlight! Boasting a black 3 1/2" 420 stainless steel blade with partial serrations, this tough folder can tackle practically any day-to-day cutting job and then some. Like an ambulance speeding towards the scene of an emergency, the modified clip point blade opens with impressive speed, thanks to the smooth assisted opening mechanism. Just nudge the convenient flipper or thumbstud and watch the blade fly open! The handsome orange and black handle is forged with durable, corrosion-resistant aluminum and features a classic "star of life" with asklepian and "EMS" etched in white. At 5" closed, the EMS Everyday Carry Pocket Knife fits comfortably in jeans pockets, especially with the included black aluminum pocket clip. Faithful to its moniker, this knife is a perfect "everyday carry" built strong to withstand the daily grind. It could even save your life in an emergency! 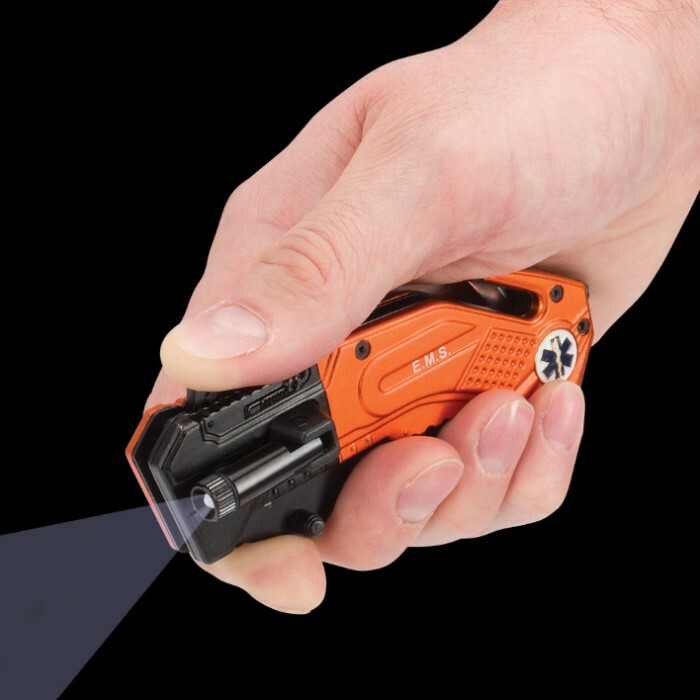 The integrated seatbelt cutter and glass breaker allow you to escape or assist others with escaping entrapment in a vehicle or building, and the small-but-bright built-in LED flashlight is perfect for "escaping" the dark. The flashlight is mounted on a sturdy hinge and swings out 90 degrees for multi-directional illumination. Black Legion's EMS Everyday Carry Pocket Knife makes a heartfelt, memorable gift for a paramedic or EMT in your life. It’s also a great way for civilians to show their solidarity and support for the brave men and women who risk their lives to keep the public safe in calamitous times. You won't find a better knife at this price anywhere else, so don't wait. Order today! I got this knife on sale with free shipping. It will come in handy in a bad situation. But , hey, I learned to be prepared very early, as a boy scout. Our motto was be prepared ! Only neg. thing is the pocket clip is on the wrong end . Seems that they do this on purpose so it can't be deployed very fast. I have removed the clip and drilled & tapped new holes on the other end of many of these knives. Now it is one movement and its open and ready. FYI. Nice everyday carry, obviously for the price I wasn't expecting superb quality but has good action on assisted opening, and some nice bells and whistles like the mini flashlight, glass breaker, and belt cutter. Not entirely sure if those would actually hold up to the test, but still worth it to pick one of these up if you are looking for a cheap knife with these features. 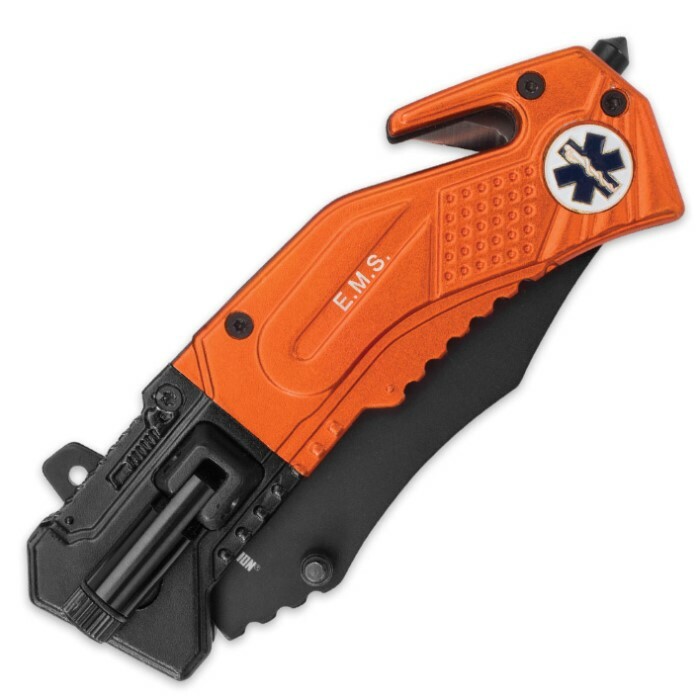 Only complaint I have, albeit a very minor one, was the EMS logo was already unglued from the handle when it arrived, not a big deal as a little super glue will fix that.